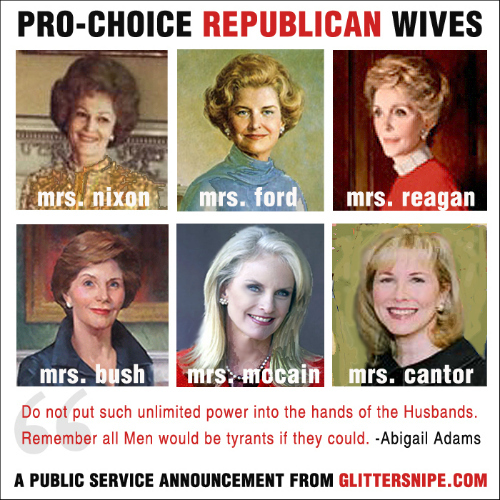 What Do Six Republican Wives And Planned Parenthood Have In Common? These ladies know who should make decisions about a woman’s body. Mrs. Nixon’s Source. , Mrs. Ford’s Source. , Mrs. Reagan’s Source. , Mrs. Bush’s Source. , Mrs. McCain’s Source. , Mrs. Cantor’s Source. Found on Glittersnipe’s Facebook page. Originally submitted by volunteer editor Rain L.